You’ve taken the time to craft your perfect presentation and now you’re not sure how to feel confident presenting it. Should you memorize it? Use flash cards? Wing it? What’s the best way to practice and prep your talk? There’s no one “right” answer to that. We all absorb and retain information in our own way. 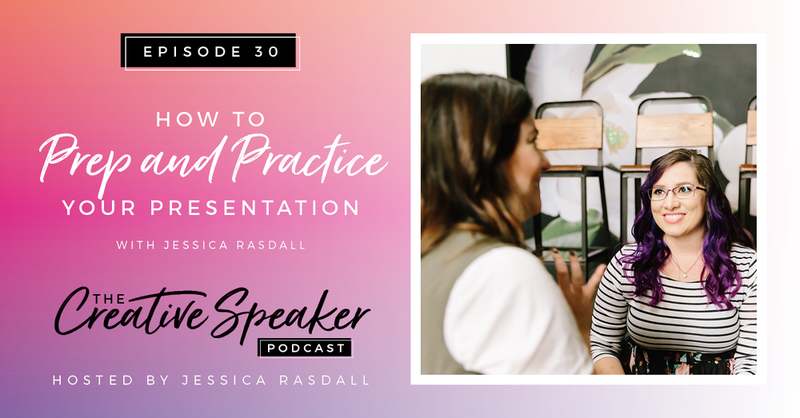 In this episode, I want to share what has worked best for myself and my clients to practice and prepare before it’s time to deliver their presentation so that you can form your own version of preparation and presentation! Having your talk done at least two weeks prior to the event will give enough time to rehearse, making you so much more comfortable to present it. Your presentation is a road map that will guide you as you take your audience on a journey. You don’t want to memorize your presentation word for word. Instead, memorize the first and last line of each section. Figure out how you want your presentation to look. From using slides to creating an outlines or notecards, these details are important as you prepare. Film yourself practicing your presentation. This will help you make adjustments and get comfortable delivering your presentation.